National Rail has repeated its support for plans to improve Pershore Train Station and add a new, larger car park for rail users. And the news follows the completion of important station platform extensions which have been completed in Pershore in just seven days – allowing the station to handle longer trains. The plan to build a new car park opposite the station has been developed by Wychavon District Council and Harriett has been lobbying the Department for Transport, Great Western Railways and Network Rail to find an affordable scheme to connect the new car park to the station. Network Rail director Mark Langman visited the town earlier in the month to meet with Harriett and her colleague Nigel Huddleston MP, to discuss platform improvements and plans to build an additional new car park. Harriett commented: “The swift completion of platform improvements is good news for Pershore rail users and I am glad for the repeated commitment from Network Rail supporting the plans to make more use of this popular station. “I met with Mark Langman in Westminster during the summer and he agreed to visit the town and talk about how we can try to overcome the hurdles which had made this project disproportionately expensive. “I am grateful for Mark’s commitment to make this project move forward and it is now down to me and Nigel to lobby the Department for Transport to get its approval for this scheme. 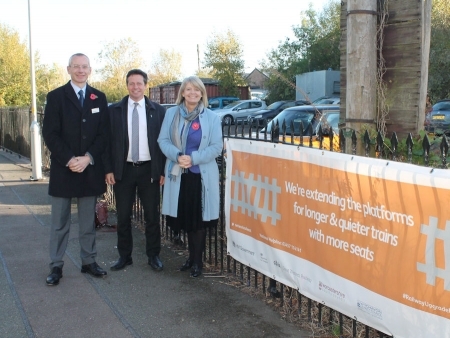 Photo: At Pershore Station, Network Rail’s Mark Langman, Nigel Huddleston MP and Harriett Baldwin MP.